Konrad Adenauer (1876-1967) was mayor of Cologne for many years and the first Chancellor of the Federal Republic of Germany. His house, built in 1936, can be found in Rhöndorf in the middle of an extremely colourful garden with a charming view over the Rhine valley. A steep path along several terraces and sets of steps runs through the colourful, sloping garden. The garden’s variety of plants, trees, sculptures, fountains and walls gives it a southern-European feel, making it reminiscent of northern Italy, a landscape of which Adenauer was extremely fond. Stones walls of differing heights provide the garden’s structure and create terraces. A large fig tree grows at the house terrace where splendid plants in pots are positioned to catch the eye in summer. Besides fruit trees, oleanders, camellias and azaleas, a large number of roses thrive and flower in this Mediterranean terraced garden. Scented roses were Konrad Adenauer’s favourite flowers. A small water-lily pool with water features, which is flanked by life-size figures of de Gaulle and Adenauer, provides refreshing coolness on hot summer days. Adenauer had a round garden pavilion built in a prominent spot by his son-in-law, the architect Multhaupt. He often worked here on his “Memoirs”. There are fantastic views over the Rhine valley, the Rolandsbogen, Nonnenwerth island and theDrachenfels hill from almost every spot in the terrace garden. The house and garden can only be viewed on guided tours. gardens and thus also to the work of gardeners. who speak of gardens as a place of renewal. in nature and in politics. A politician, hobby gardener and lover of roses, Konrad Adenauer (1876-1967) was mayor of Cologne for many years and the first Chancellor of the Federal Republic of Germany. His house, built in 1936/1937, can be found in Rhöndorf in the middle of an extremely colourful garden with a charming view over the Rhine valley. A steep path runs along several terraces and sets of steps through the colourful, sloping 4000 m2 garden, formerly a vineyard. The variety of plants, trees, sculptures, fountains and walls in this terraced garden on a slope of the Siebengebirge hills gives it a southern-European feel, making it reminiscent of northern Italy, a landscape of which Adenauer was extremely fond. Thus, Konrad Adenauer planted, e.g. a date palm on the lower terrace. He had brought it with him from the Italian resort Cadenabbia, where he spent his holidays. Stone walls of differing heights covered with vines and jasmine provide the garden’s structure and create terraces. A large fig tree grows at the house terrace and the splendid blue blossoms of the Agapanthus plants (liliaceous plants) catch the eye in summer. The foxglove tree (Paulownia tomentosa), planted in 1937, has grown into a splendid specimen today. It dominates the garden in spring, its blossoms ranging from mauve to deep purple. Besides fruit trees, oleanders, camellias and azaleas, more than 1,500 rose bushes, rose trees and climbing roses thrive and flower in this Mediterranean terraced garden. Perfumed roses were Konrad Adenauer’s favourite flowers, above all the yellow, slightly-filled tea hybrid “Gloria Dei”, the orange-pink climbing rose “President Herbert Hoover” and of course the strongly perfumed, dark-red tea hybrid “Konrad Adenauer”. It has a special position beside the stone double-basin fountain. The “Konrad Adenauer rose?” – No, of course I didn’t breed it. I am a lover of roses – as many as there are in the world – but not a rose breeder. I do, however, follow the work of rose breeders and am delighted when a good new variety is produced which proves to be of value. The rose which is named after me was bred by a German breeder and he asked for permission to name it after me. After seeing the rose and smelling its perfume I agreed. Now the “Konrad Adenauer” rose is in its second bloom. I am very taken with it and it gives me real pleasure that a rose of this kind should be linked with my name. I rather regret that modern breeders today increasingly follow fashion, concentrating on the size of the blooms and on varied colours in their work, often thereby disregarding perfume and clear colours. In my view, the perfume is the most beautiful thing about a rose besides its shape and a pure, brilliant colour. It is all these things together which go to make up the typical character of a rose. A small water-lily pool with water features provides refreshing coolness on hot summer days. 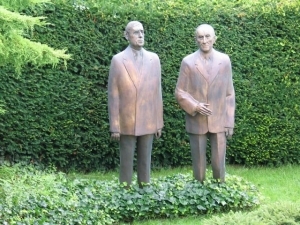 It is flanked by life-size figures of de Gaulle and Adenauer, created by Imre Varga. In 1963, Adenauer had a round garden pavilion built in a prominent spot by his son-in-law, the architect Heribert Multhaupt. He enjoyed the view over the Rhine valley from here and worked on his “Memoirs”. Mediterranean mementoes from holidays spent in northern Italy can be found surrounded by blossoming roses on the path to the pavilion: four putti representing the four seasons, a Neptune fountain and a small fountain with a bronze figure, the latter a present from the mayor of Cadenabbia. To the right of the dining room, a trumpet vine blossoms extravagantly, winding its way up to the cornice in the summer months with its long red, yellow and orange funnel-shaped flowers. At the front of the house, a fig tree thrives, the sweet fruits of which Adenauer’s grandchildren were once very fond. Today, they can even be picked from the balcony. In 1958, Adenauer had a bocce court laid out in his garden. Bocce became his favourite sport after his first holiday at Lake Como and provided a counterbalance to his political work. 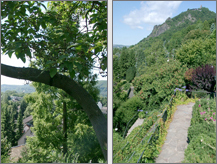 There are fantastic views throughout the seasons from almost every spot in the southern-European terrace garden on a Siebengebirge hill – over the Rhine valley, the Rolandsbogen, Nonnenwerth island and Drachenfels hill. 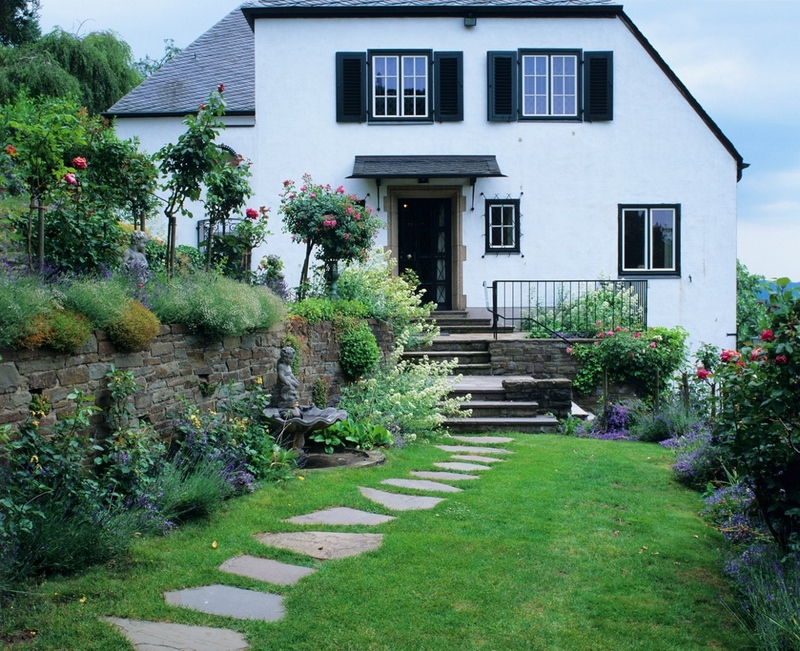 The house and garden can only be visited on guided tours. from early to late summer and far into autumn. Stiftung Bundeskanzler-Adenauer-Haus, Hrsg. (1997): Konrad Adenauer. Dokumente aus vier Epochen deutscher Geschichte. Das Buch zur Ausstellung. Tuesdays to Sundays from 10.00 a.m. until 4.30 p.m (6.00 p.m. mid April until end October). Closed on Mondays. Guided tours of Konrad Adenauer’s garden and house take place during opening times when there is sufficient demand. The last tour begins at 4 p.m.
Advance notice is requested for groups of more than 10 people. Parking: Designated free car park in Rhöndorf and signposted footpath from there to the Adenauer Haus (approx. 500 metres). Accessibility – in the park/ garden from the car park: Due to the large number of steps and the steep slope, the paths are unsuitable for visitors with limited mobility or can only be negotiated with assistance.